The Analysis-ToolPak add-in is a third party Excel add-in that provides special analysis tools suitable for medium scale statistical analysis. This add-in provides a number of additional analysis techniques. This add-in should not be installed unless you are going to use the additional Data Analysis functionality as Excel will take slightly longer to open with this add-in installed. In Excel 2003 this add-in also provided additional worksheet functions, although in Excel 2007 these were included as standard. Once you have the Analysis-ToolPak add-in installed an extra button will appear at the on the far right of your Data tab. Anova: Single Factor Determines if there is a relationship between two data sets by performing an analysis of variance. Anova: Two Factor with Replication Determines if there is a relationship between two data sets by performing an analysis of variance. This includes more than one sample of data for each group. Anova: Two-Factor without Replication Determines if there is a relationship between two data sets by performing an analysis of variance. This does not include more than one sample of data for each group. Correlation Compares two sets of data to determine if there is any relationship between them. Covariance Calculates the average of the product of deviations of values from the means of each data set. Descriptive Statistics Calculates a range of statistical measurements and summarises them into a table. This table includes calculations for: Mean, Standard Error, Median, Mode, Standard Deviation, Sample Variance, Kurtosis, Skewness, Range, Minimum, Maximum, Sum, Count, Largest, Smallest and Confidence Level. Exponential Smoothing Smooths data, weighting more recent data heavier. F-Test Two Sample for Variances Compares the variances between two groups of data. Variance is a measure of how much the values are dispersed around the mean value. Fourier Analysis Discrete Fourier Transform (DFT) or Fast Fourier Transform (FFT) method, including reverse transforms. Histogram Counts occurrences in each of several data bins. Moving Average Calculates a moving average to allow you to smooth out a data series that contains peaks. Random Number Generation Creates a number of several types of random numbers including Uniform, Normal, Bernoulli, Poisson, Patterned and Discrete. Rank and Percentile Creates a list of the numbers ranked from highest to lowest and also provides a percentile value which indicates how an individual number ranks compared to the other numbers. Regression Creates a table of statistics that result from least-squares regression. Sampling Samples a population randomly or periodically. T-Test: Paired Two Sample for Means Paired two-sample students T-Test. T-Test: Two Sample assuming equal Variances Paired two sample T-Test assuming equal means. T-Test: Two Sample assuming unequal Variances Heteroscedastic T-Test ? 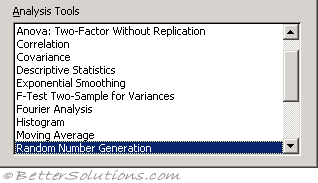 Z-Test: Two Sample for Means Two sample Z-Test for means with known variances. There are actually two possible add-ins that can be installed relating to Analysis-ToolPak. The add-in called Analysis-ToolPak - VBA is only needed if you are going to call the worksheet functions from VBA. In Excel 2003 if you try to use any of these functions without the add-in installed the function will return the #NAME? error.